4532 ✉ 09. Nov 3 Kr. Carmine, vertical pair, 7 Kr. Blue and three copy the 18 Kr. Olive brown as very scarce high franking from 67 Kr. 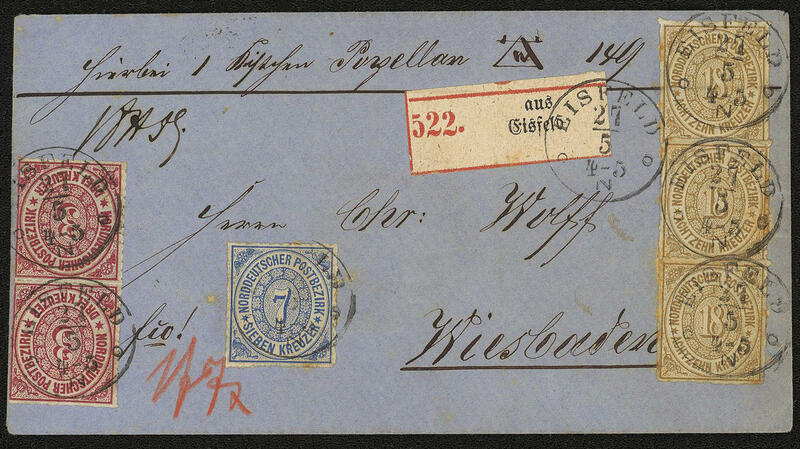 On attractive accompanying letter for parcels, by four values in the margin region here and there patina, with single circle postmark \"EISFELD\" with on the back full got seal to Wiesbaden. So high frankings from the Kreuzer district are very rare! 4533 ∆ 16 1 Gr. 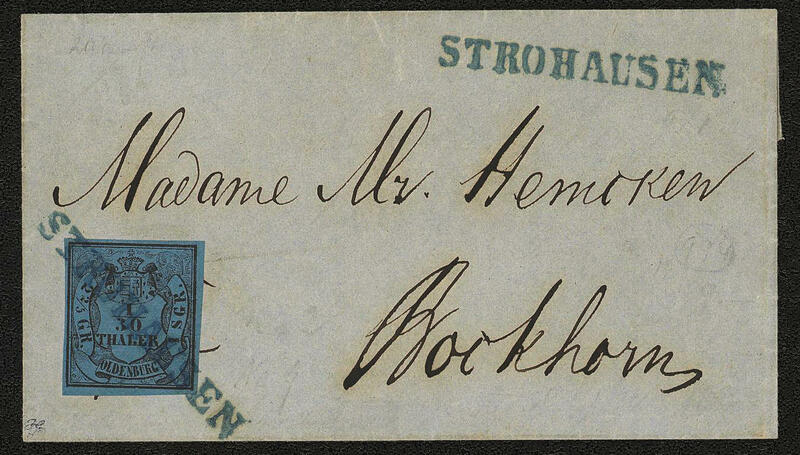 Carmine red, fresh colors, trace of crease, on attractive letter piece, trace of crease with especially clear mounted horseshoe cancel \"LÜBECK 30. SEPTBR. 71. \". A very rare horseshoe cancel, which only a week was used. It is a matter herewith about the earliest known Stamp date! (Spalink no. 4). Photo expertize Spalink BPP. 4534 ✉ 16 1 Gr. 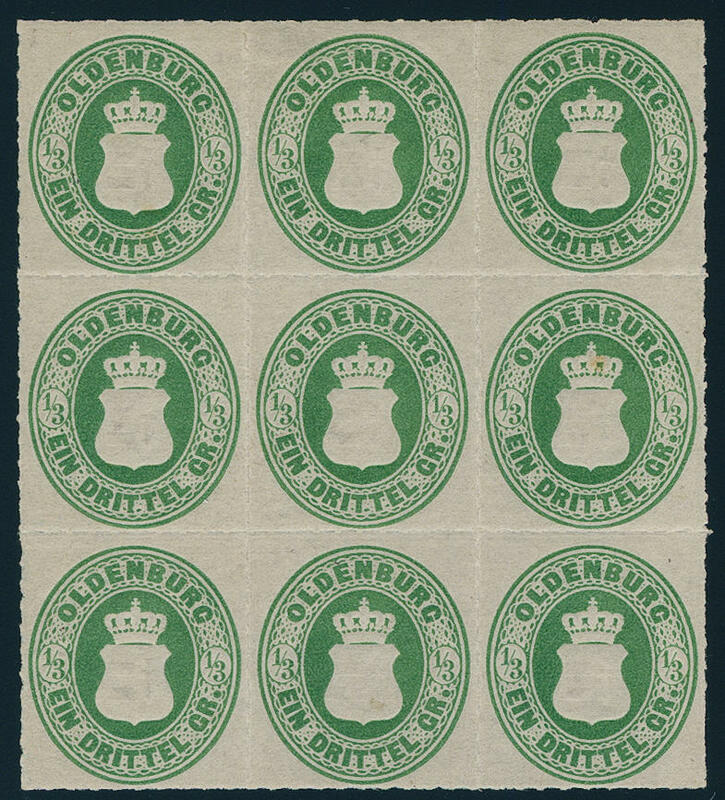 Carmine red, having bright colors, excellent perforated outstanding quality on beautiful small-format, in green printed ornament letter, front- and reverse wonderful illustrated with clear framed cancel of 3 lines \"STOLBERG government district AACHEN 30.12.69\" to a mister Potthoff in Aachen. One of the most beautiful classic ornamental letters Germany's and a Honor for each sophisticated collection! 4535 ✉ 16 1 Gr. 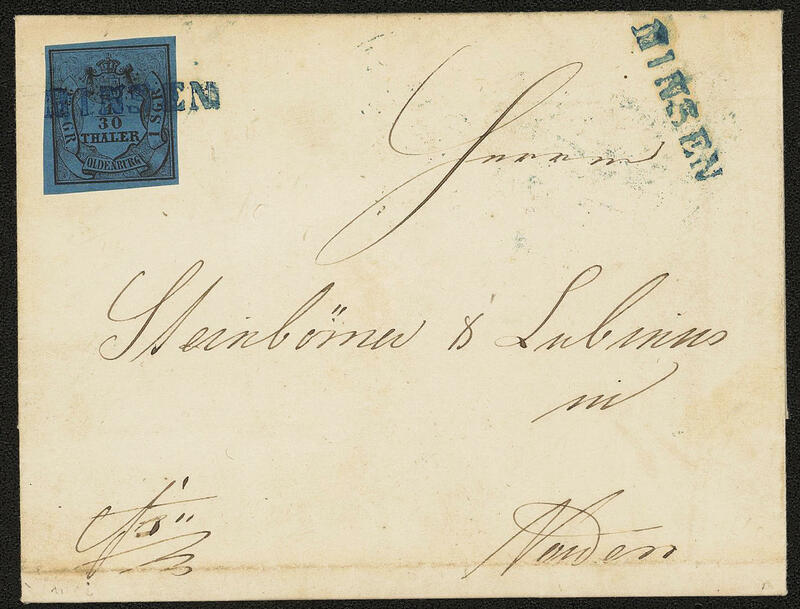 Carmine, perforated, four having bright colors items in outstanding quality including a horizontal pair as wonderful multiple franking on very nice cover with clear horseshoe cancel \"LÜBECK 6.6.71. \" over St. Petersburg transported to \"ULEABORG / Finland\". A scarce destination. Letter in outstanding quality for the highest standards! Expertized Spalink BPP. 4536 ✉ 17 2 Gr. Gray ultramarine, fresh colors and in perfect condition as correctly franked single franking on money order with two clearly frame cancel \"grand cross 14.2. 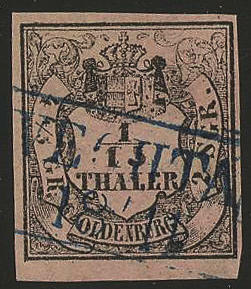 (1871) \" over 25 Thaler to Potsdam. Such franked money order forms of the North German postal district are especially in perfect quality extraordinarily rare! Photo expertize Mehlmann BPP. 4466 ✉ 2I 1 / 30 Th. 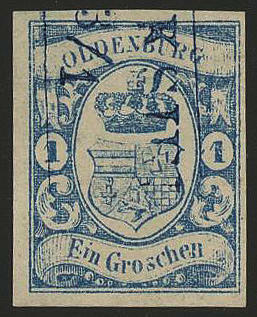 Black on bright gray ultramarine, type I, having bright colors and piece in outstanding quality with enormous margins on beautiful small-format cover with two crystal clear blue single line cancel \"STROHAUSEN\" to Ram horn. A dreamlike nice letter in outstanding quality for your highest requirements! Provenance: ex collection Walter angel. 4467 ✉ 2III 1 / 30 Thaler black on bright gray ultramarine, type III, fresh colors and on all sides perfect margins on an especially beautiful ornament letter with stamped border ornaments and printed margin lines in gold and green, without sender lid, with single line cancel \"FRANCO\" and blue additional rectangle cancel \"OLDENBURG 3.1. 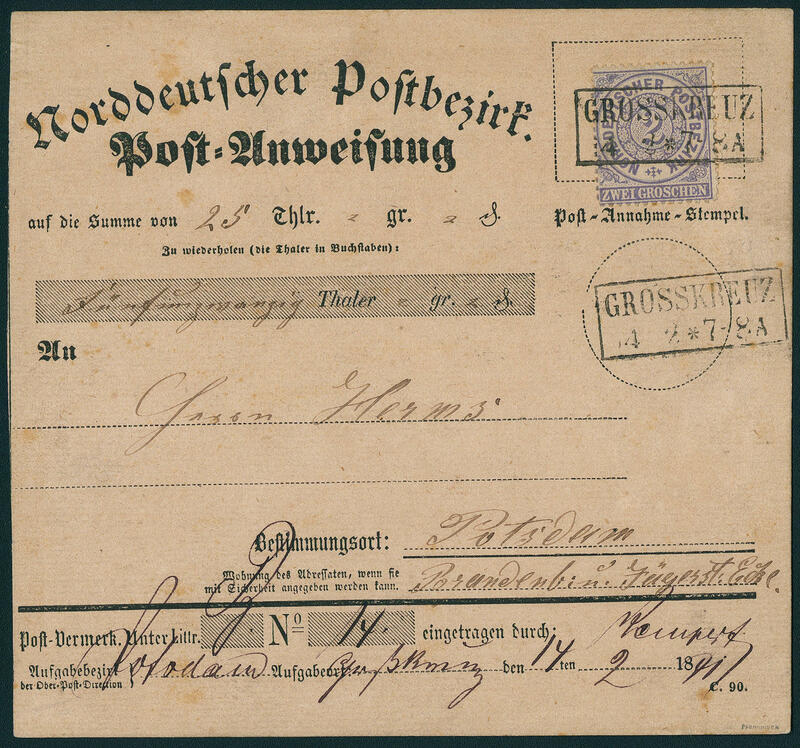 \" to Delmenhorst, correctly franked franked. 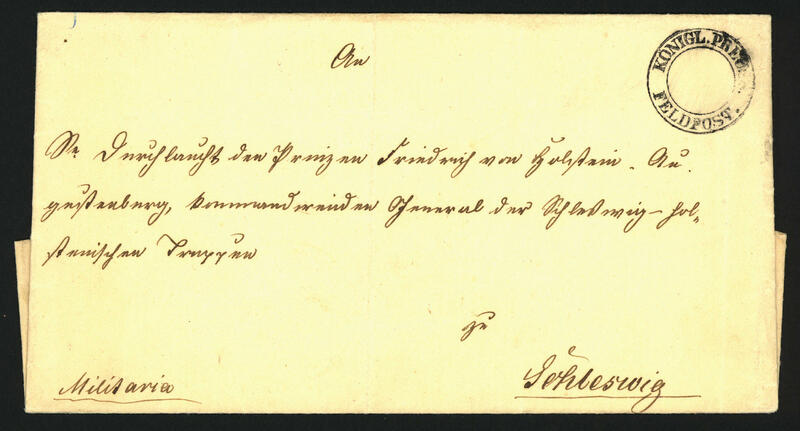 Colored ornamental letters of the Old German States are general very rare, whereby it be especially from Oldenburg about a pronounced rarity act! Photo expertise \"genuine and immaculate\" Berger BPP. 4468 ✉ 2III 1 / 30 Th. 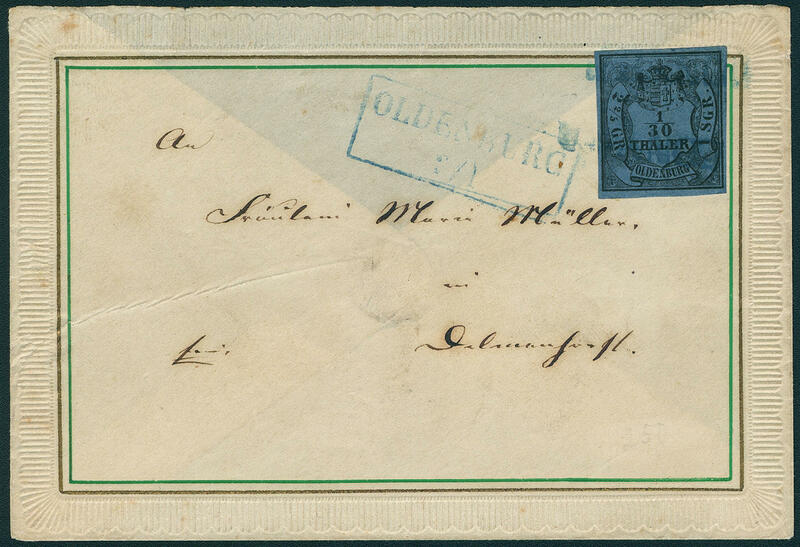 Black on bright gray ultramarine, type III, wonderful having bright colors and on all sides piece in outstanding quality with enormous margins on very nice cover with two clearly blue single line cancel \"MINSEN\" north with arrival postmark. A dreamlike nice letter in outstanding quality this extremely rarely cancellation for the highest standards! Provenance: ex collection Walter angel. 4469 ⊙ 3III 1 / 15 Th. In type III, having bright colors and neat cancelled extremely fine copy, photo expertize \"genuine and immaculate\" Stegmüller BPP. 4470 ⊙ 8 3 Gr. 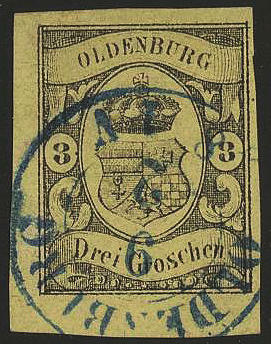 Black on yellow, a wonderful having bright colors outstanding quality from margin of sheet springing with neat and clear mounted blue two ring cancel \"OLDENBURG\". An outstanding quality this sought-after issue and as margin copy very rare! Photo expertize \"faultless condition\" Stegmüller BPP. 4471 ⊙ 10b 1 / 3 Gr. 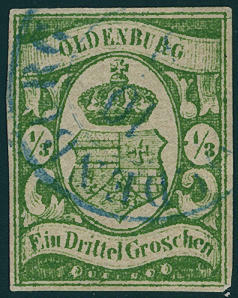 Moss green, wonderful fresh colors and good margins with blue two ring cancel \"OLDENBURG\". An outstanding quality this Old Germany rarity! Photo expertize \"faultless condition\" Stegmüller BPP. 4473 ✉ 11a 1 / 2 Gr. Brown orange, wonderful fresh colors and with wide margins on very nice, correctly franked franked local letter with blue rectangle cancel \"OVELGÖNNE 6.5.62. \". 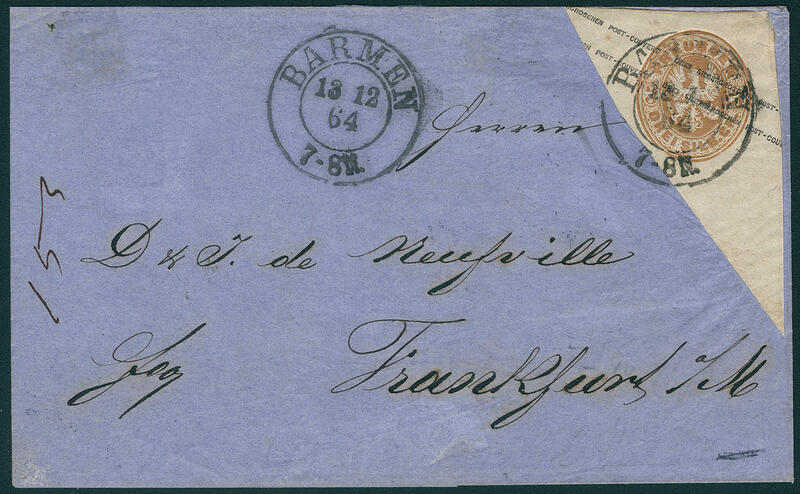 Original was the cover already before franking with the rectangle cancel provided. Possibly wanted the post office clerk the cover cash frank. There this non-admissible was, was he franked. An especially nice and in this kind unique cover for the sophisticated special collection! Photo certificates Walter angel BPP, Florian Berger BPP. 4474 ⊙ 12a 1 Gr. Dark cobalt blue, having bright colors, on all sides perfect margined used extremely fine copy, photo expertize \"genuine and immaculate\" Stegmüller BPP. 4475 / 15B 1 / 3 Gr. Blackish yellowish green, roulette 10, wonderful block of nine, wonderful fresh colors, mostly mint never hinged, very good roulette in perfect condition, an especially attractive and scarce unit! 4485 ✉ 212 \"212\", number postmark razor-sharp on beautiful small-format cover with additional likewise clear two ring cancel \"BÜREN 17.1. (1850), with 2 Sgr., mostly having full to wide margins, left to the margin line cut. Rare! 4482 ✉ U7A 7 Sgr. Brick red, octagon postal stationery cover, Shilling no. 1, fresh colors \"GÜTZKOW 8.1. 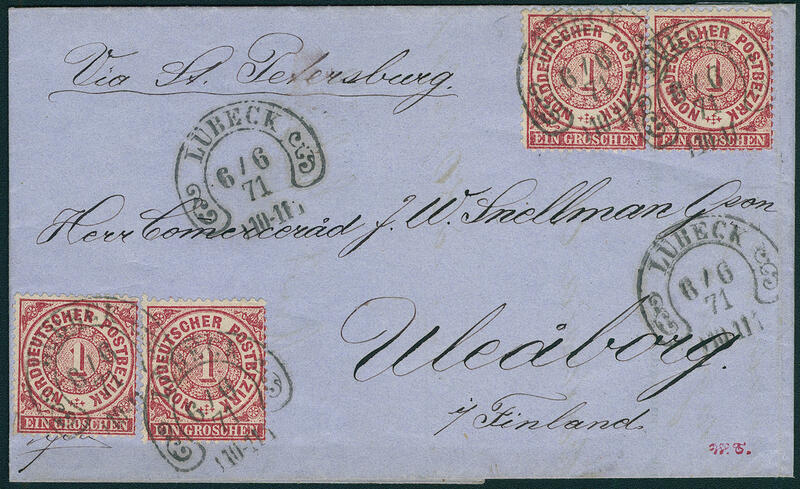 (1855) \" with additional red 1-circle cancel \"P. \" and red 1-circle cancel \"PAID 12. Yes. 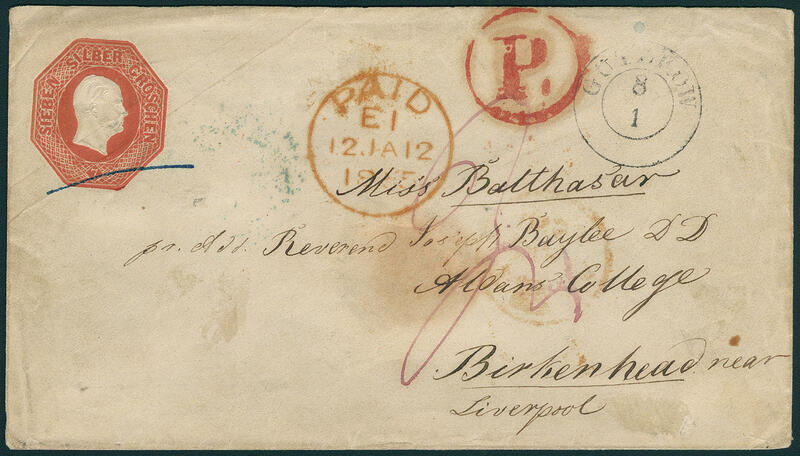 12 1855\" to Birkenhead / liverpool with arrival postmark. 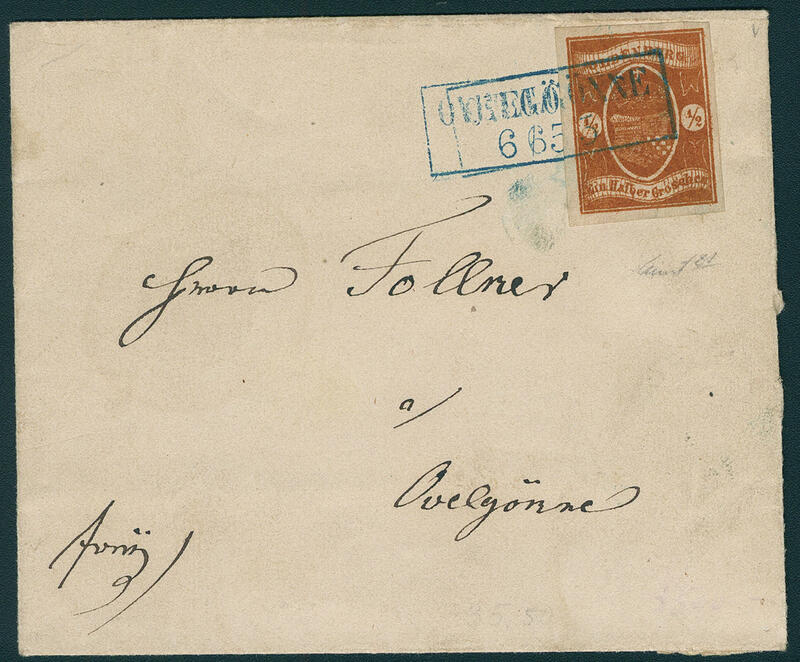 A very attractive copy of this rare postal stationery! 4483 ✉ U11ADD 1 Silver penny rose, postal stationery cover with double impresssion of the value, one of them in blind embossing, with clear rectangle cancel \"KOBYLIN\" to Wroclaw with reverse issue cancel. 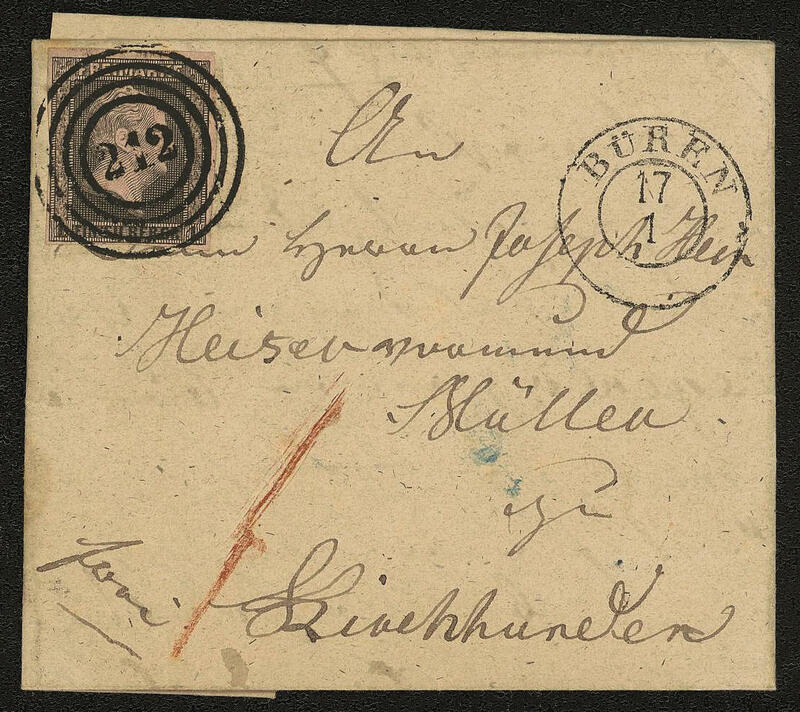 Used examples this printing error are extremely rare and to class among the rarities the Prussia postal stationery! Expertized Brettl BPP. 4484 ✉ GAA17 3 Sgr. 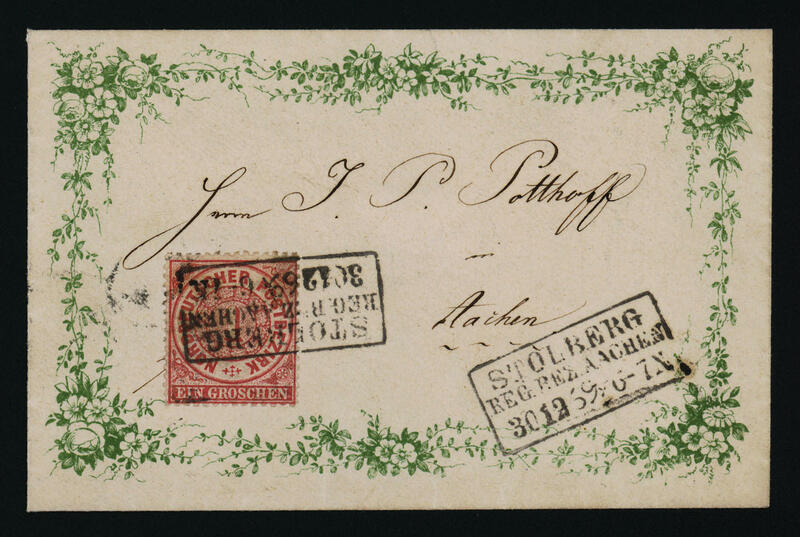 Brown, cut out of postal stationery, very unusual triangular cut on cover with clean mounted turning into two ring cancel \"BARMEN 13.12.64\", this once again additional, to Frankfurt. An especially nice and in this kind extremely unusually document, because the postal stationery cut mostly round cut were. 4476 ✉ \"royally. PREUSS. Army postal service\", clear two ring cancel from the 1. 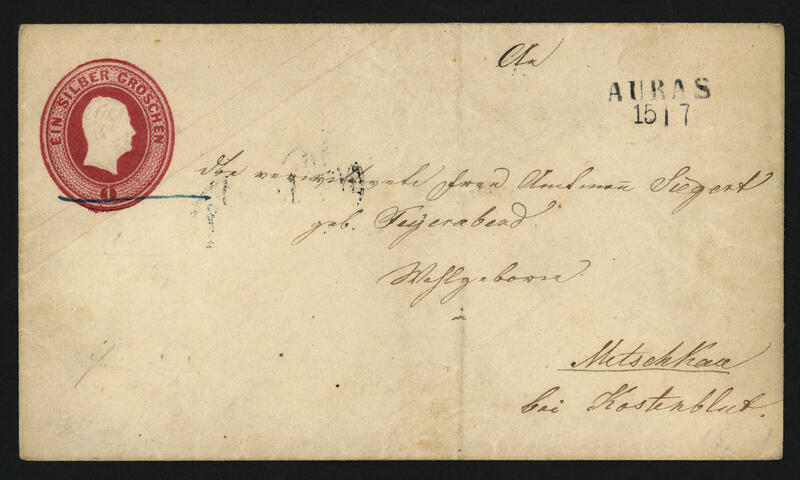 Danish war (1848 / 51) on mint military letter at his serenity the princes Friedrich from Holstein in Schleswig. An especially nice cover this large cancellation rarity! 4486 ✉ U1A \"AURAS 15 / 7\", the extraordinarily scarce two line cancel razor-sharp on gef. Postal stationery envelope 1 Sgr. (Michel no. 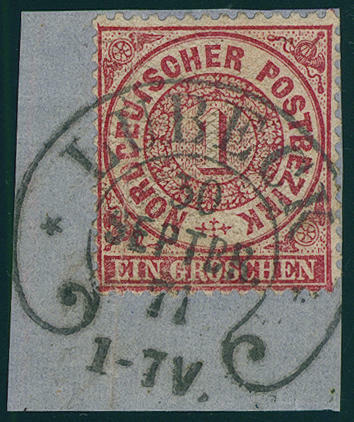 U1 A) a large Prussia stamp rarity, which in the Henke special catalogue with collector's price is listed.